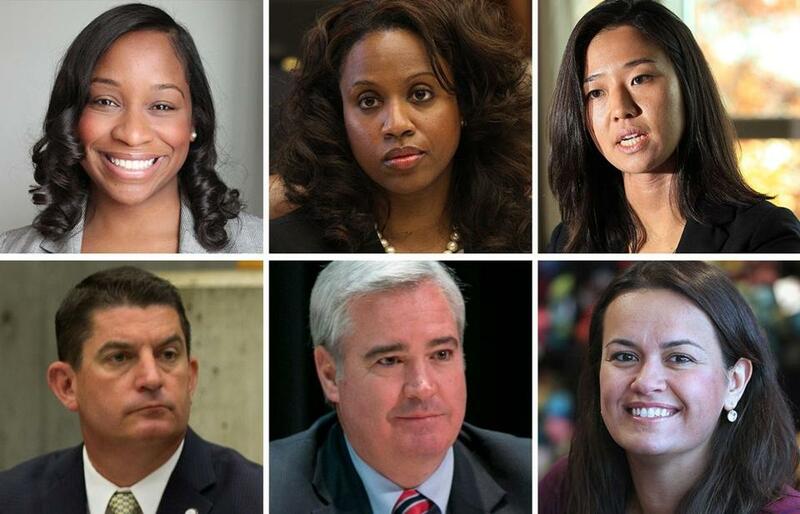 Top row, from left: Andrea Campbell, Ayanna Pressley, and Michelle Wu. Bottom row, from left: Tim McCarthy, Michael Flaherty, and Annissa Essaibi George. The Globe endorses Ayanna Pressley and Michelle Wu for reelection to the Boston City Council, because it would be silly not to. Among the five candidates running for the four available at-large council seats next Tuesday, the two women clearly stand out as the best candidates. Voters who subscribe to the belief that margins of victory matter would be justified in voting for only Pressley and Wu so that they top the field. The two incumbent councilors could not be more different stylistically. Pressley, a charismatic campaigner, has a lengthier record, and has managed to shepherd long-needed reforms to the city’s liquor licensing system. She has a keen understanding of how to translate lofty ideas about providing economic opportunity into city policies. Wu, who is just finishing her first term, got off to a controversial start when she voted for Bill Linehan as council president. That enraged some of the liberal voters who supported her. Wu hasn’t backed down, and said the vote yielded better council governance. Critics may never agree with her on the Linehan vote, but she retains all the traits that made her an appealing candidate in the first place. She has used the last two years to find opportunities to advance a progressive agenda; for instance, she was one of the councilors who pushed through paid parental leave for city employees. That leaves three candidates — incumbents Michael F. Flaherty and Stephen Murphy, and challenger Annissa Essaibi George — for the remaining two at-large seats. Although both Flaherty and Essaibi George come with their own drawbacks, voters who want to cast a full ballot can confidently round it out with these two candidates. Flaherty, a onetime mayoral candidate who was reelected to the council in 2013, has been an important voice on the council. He has an independent streak, and scored points for accountability this week when he forced the council to hold an actual vote on its ill-advised pay raise, instead of allowing it to take effect without a vote. He has never shown the same obsequiousness toward mayors as some of his colleagues, and is skilled at navigating nitty-gritty issues. The only whisper of excitement is for four at-large seats and the suspenseful District 4 matchup. It’s unfortunate, though, that Flaherty has continued to devote a portion of those skills to his private legal practice rather than putting his full energies into the council. He says his legal work at a downtown firm doesn’t interfere with his council commitments, but he can help assuage concerns by offering more transparency about his clients and time commitments. Essaibi George is a Boston Public Schools teacher and owner of a yarn store in Dorchester (disclosure: her mother is a Globe employee). She would bring the perspective of a small business owner, and wants to draw on her teaching experience to help improve the city’s high schools. She has specific ideas: For example, Essaibi George wants to push back opening times at high schools. That’s a deeply sensible idea, endorsed by the American Academy of Pediatrics and backed up by evidence showing high school students are healthier and skip school less often when classes start later in the day. However, it has also proven far more difficult to get through the political system than, for instance, sending a man to the moon. If Essaibi George wins election and follows through on her vow, it would mark a major accomplishment. The chief problem with Essaibi George in the 2013 election was her bristling hostility to charter schools — the institutions many of the Boston families that she’s seeking to represent rely on for their children’s education. She hasn’t changed her views, but she has moderated her tone. Yet if she uses the council as a platform to tilt at charters, it will represent a squandered opportunity and show she’s not interested in representing the whole city. Murphy, who has served on the council for years, can boast of past accomplishments. He has been instrumental in engineering the payment-in-lieu-of-taxes assessed to local universities and nonprofits, and has a deep understanding of the city budget. Over the last two years, though, he seems to be partially checked out — spending time at his condo in Florida, where records show he was charging meals to his campaign account. Meanwhile, he seems to be treating his office budget as a goodie bag, doling out jobs to friends instead of seeking employees who will do the best work for the public. Since someone has to be the odd man out on Election Day, it ought to be Murphy. 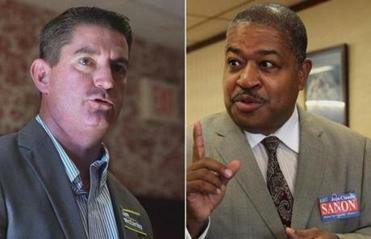 Of the two seriously contested district races, the closest call is in District 5, where incumbent Tim McCarthy faces a rematch with Jean-Claude Sanon, the candidate he defeated to reach the council in 2013. The district includes Hyde Park, along with parts of Mattapan and Roslindale, and is among the most demographically varied in the city. A longtime aide to former mayor Tom Menino, McCarthy stumbled out of the gate in his opposition to a transit-oriented development in Hyde Park, but has otherwise compiled a good record during his first term. His commitment to meeting his district’s needs is obvious, and he deserves credit for hiring a liaison to the Haitian community. While constituent service seems to be where McCarthy’s heart lies, he has also taken some smart policy stands. His vote to approve the biolab at Boston University, listening to the experts rather than the scaremongering, also speaks well of him. Sanon, a long-time organizer in the Haitian community, made a positive impression in his first race. But he took a serious misstep by joining the fringe crusade to force the city’s school-bus contractor to rehire bus drivers who were fired for organizing an illegal strike in 2013, which left schoolchildren on the curb. McCarthy has demonstrated an aptitude for the job, and the Globe endorses him for another term. There’s less doubt about the better candidate in neighboring District 4, which includes Mattapan and a slice of Jamaica Plain: Andrea Campbell, 33, deserves to be the district’s next councilor. Campbell, an attorney, brings a compelling background to the race. She grew up in Roxbury and Mattapan and attended Boston Latin School and Princeton. She has experienced family tragedy, including the death of her twin brother while he was in pretrial detention. The 32-year incumbent, Charles Yancey, is a decent man who seems to have little left to offer as a city councilor. His case for reelection rests on his decades of experience. Yancey is the longest-serving member of the council by more than a decade, but all that experience isn’t producing much for his district, or for the city. Campbell deserves a chance to bring a fresh perspective to the council.